If your tooth has undergone a root canal or is being treated for extensive decay or other damage, you may need a crown, inlay, or onlay. A dental crown protects a compromised tooth from further problems by fitting snugly and permanently over the existing tooth structure. Sometimes, instead of using a crown, Dr. Hejazi can restore a tooth with a conservative inlay or onlay, which are best described as partial crowns. If you’re in need of smile repair, please don’t hesitate to call our Spring Valley dentist and team to schedule an appointment with us at Advent Dental. Inlays and onlays are conservative restorations we use when your tooth needs more than a filling but less than a full crown. What is the difference between an inlay and an onlay? An inlay fits between the cusps of your tooth (the raised portions of the biting surfaces of teeth), while an onlay fits over them. 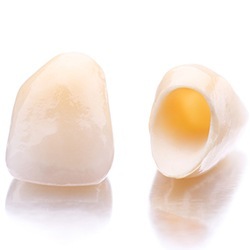 Very similar to crowns, but smaller, inlays and onlays are created from the same materials. Dr. Hejazi can tell you which one will best meet your needs after a full analysis of your mouth. Which Type of Restoration do I Need? To determine what type of restoration you will need, we’ll carefully examine your smile. We will always recommend the most conservative treatment option that will fully repair your damaged smile while maintaining the greatest amount of healthy tooth structure. How are Crowns, Inlays, & Onlays Placed? Regardless of which type of dental restoration we recommend, your treatment process will be completed over the course of two treatment visits. During the first visit, we will prepare your damaged tooth. 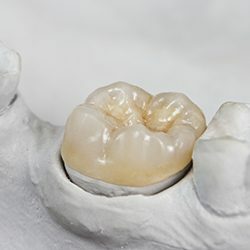 Then, bite impressions are captured to be used by our lab to craft your custom crown, inlay, or onlay. Then, a temporary restoration is placed to protect your prepared tooth or teeth. Once your final restoration is received in our office, you’ll schedule a second visit with our team. During the follow up appointment, we’ll simply remove your temporary and exchange it for a custom crafted dental crown, inlay, or onlay. Your dental restoration will look and feel much like healthy, natural teeth and should be cared for just like your regular smile with twice a day tooth brushing, once daily flossing, and biannual dental appointments. We may recommend some changes to your oral hygiene products to avoid excessive wear to your dental restoration. You should use soft bristled toothbrushes and minimally abrasive toothpaste. Patients may also want to switch to a waxed floss or water flosser to avoid tugging around the edges of your restoration.